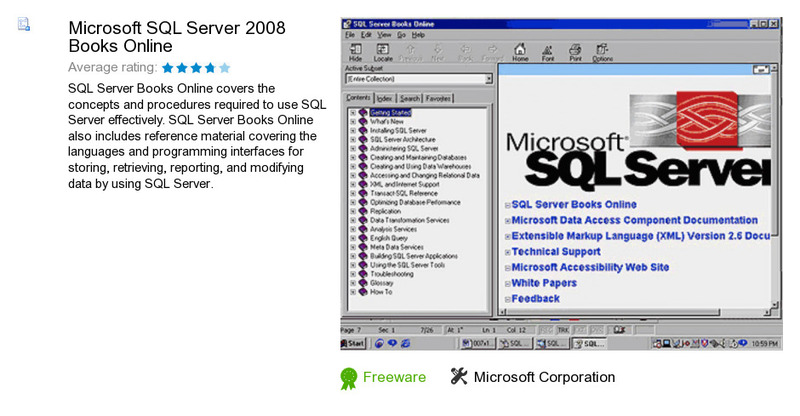 Microsoft SQL Server 2008 Books Online is a product developed by Microsoft Corporation. We know of versions 10.5, 10.0. Version 10.50.1600.1 is available for free download at our site. Microsoft SQL Server 2008 Books Online distributive has a size of 151,420,722 bytes. It works with the following extensions: dmx, mdx. Microsoft Corporation also publishes MSN Search Toolbar and Microsoft Expression Blend.